Cocoxochitl. How a medicinal ‘water pipe’ evolved into the Queen of the Garden. 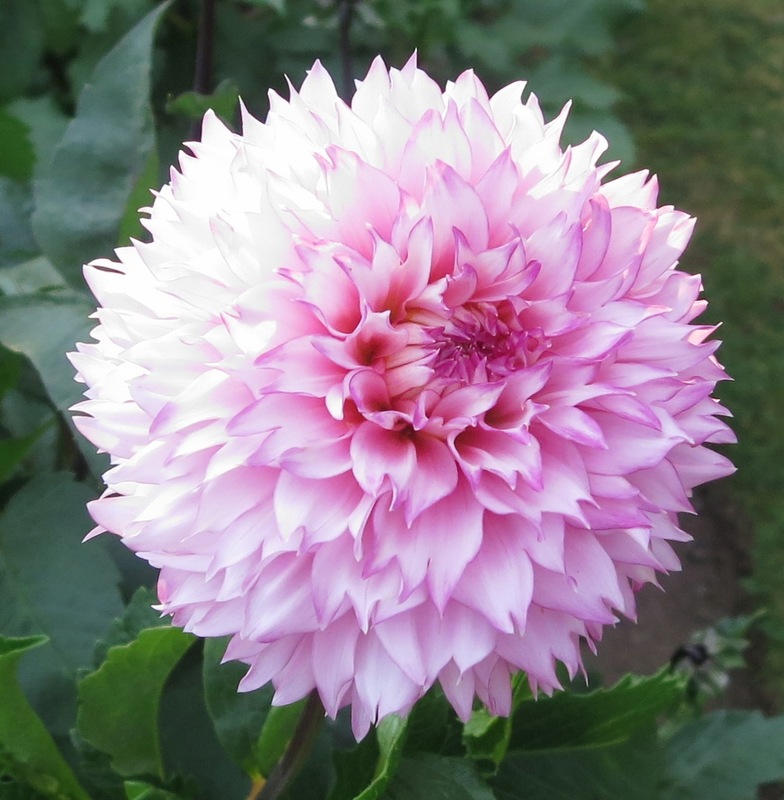 This week the Public Gardens had its perennial celebration to the ‘Queen of the Garden’… Dahlias. The Nova Scotia Dahlia Society, Neville MacKay (the very entertaining master florist), the very talented gardeners and The generous Friends volunteers, came together to inform and entertain visitors about this Victorian favorite. Dahlia Day was a tremendous success, bringing double the amount of visitors who showed up last year. Early interest in these ornamental beauties came about when King Phillip II of Spain prompted by reports of the superior medicinal practices of the Aztecs, sent his personal physician Francisco Hernandez to Mexico in 1570, to study the natural history of the land. 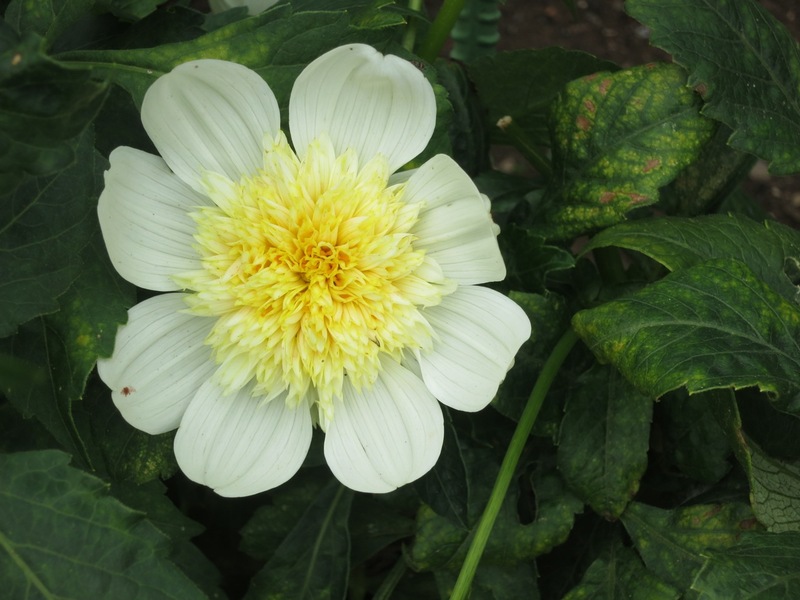 The Aztecs cultivated the Cocoxochitl (loosely translated as water cane due to its hollow stem), to use as a treatment for bladder infections and epilepsy as well as using the hollow stems of the Dahlia imperials to transport water. Dahlia’s didn’t reach Europe until the end of the 18th century when the Director of the Royal Gardens of Madrid managed to raise three seeds from a shipment sent to him from Mexico, and named them Dahlia. They were introduced into Great Britain in 1803. From the original three single petaled species, a huge variety of different flowers were produced. 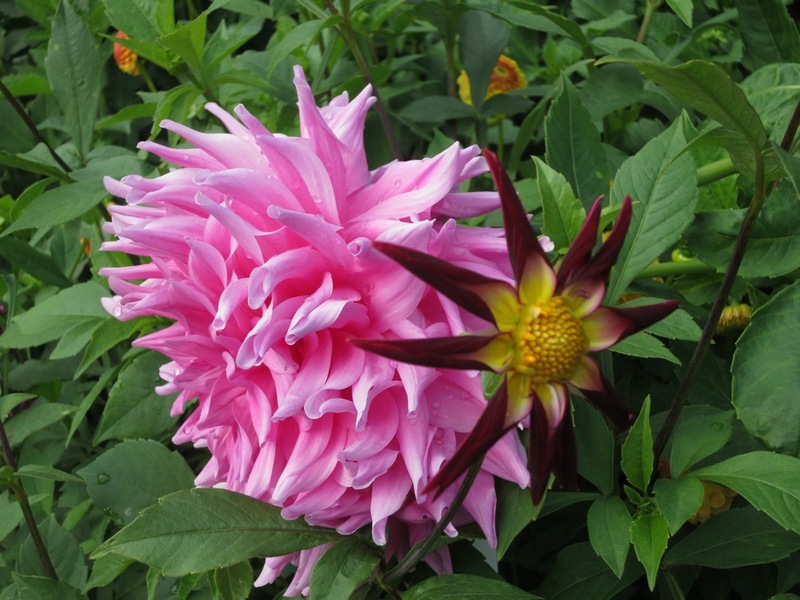 The craze for Dahlia’s began in earnest when double flowers were hybridized (1805 – 1810). When the “Stars of the Devil” or Cactus Dahlia were produced in 1872, the popularity of the ‘Queen of the Garden’ was assured. 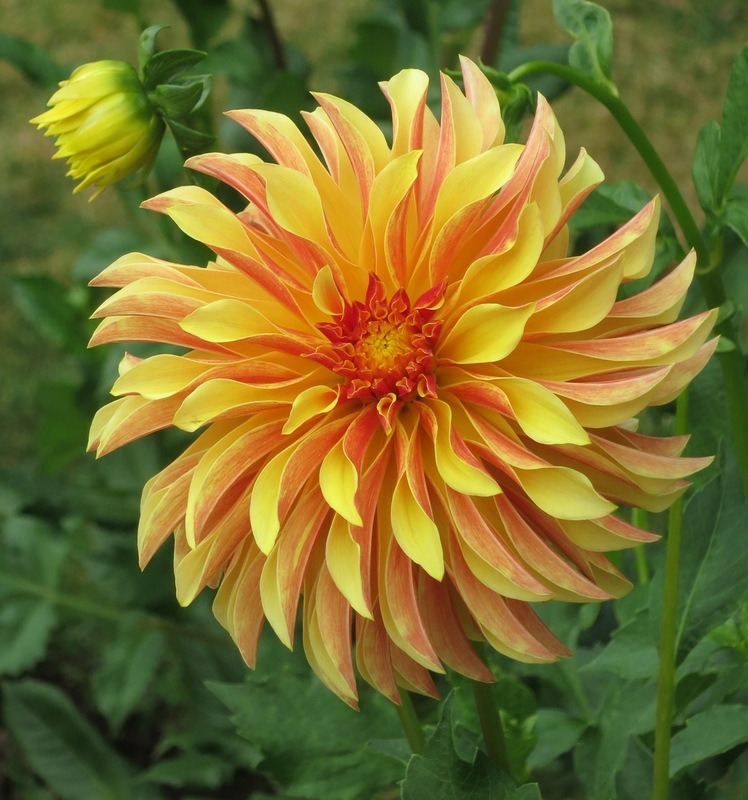 There are 17 classifications for Dahlia’s in the US (therefore here, as we buy our stock from the US) and 12 in the UK. Here are a sampling of a few from the Dahlia beds at the Gardens. Incurved Cactus Dahlia points its petals toward the face of the bloom. There is also a Straight Cactus classification. This one’s a mystery to me but I thought it was very intricate. If anyone knows the classification feel free to share the information. 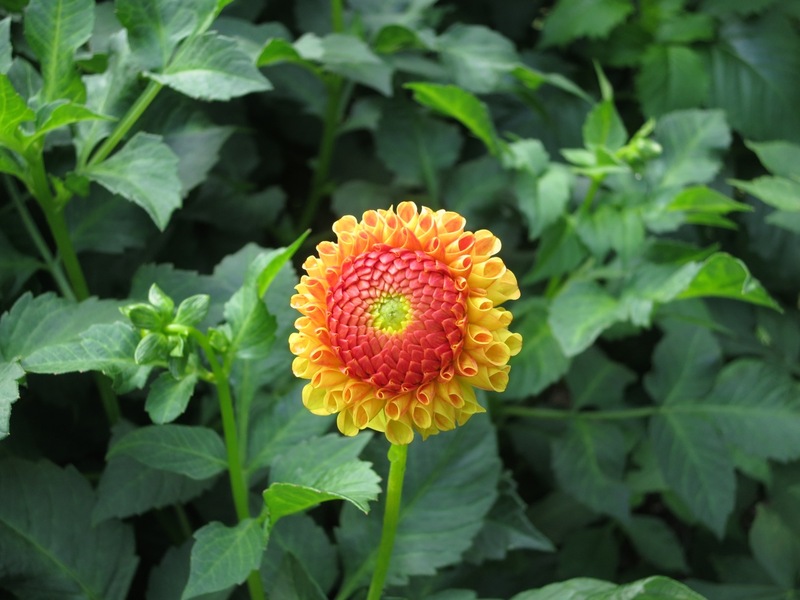 Pompom Dahlias differ from Ball Dahlias by being smaller and spherically shaped. 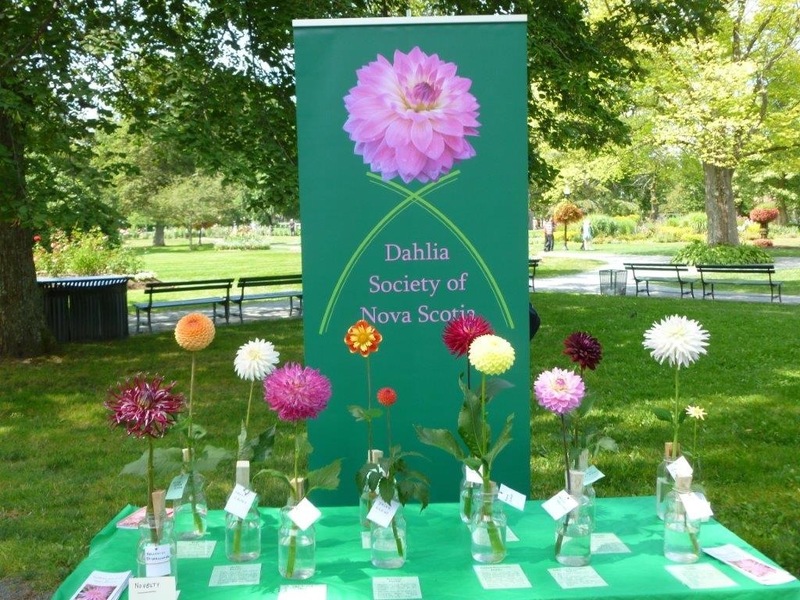 The Nova Scotia Dahlia Society put on a display of some of the Dahlias grown at the Public Gardens during Dahlia Day. 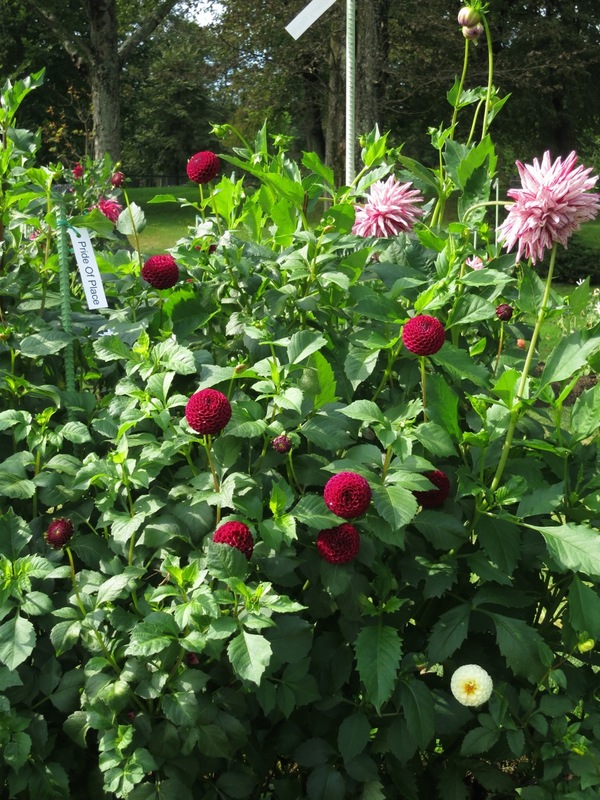 There are a huge variety of colors and different classifications growing in the two Dahlia beds at the Gardens. 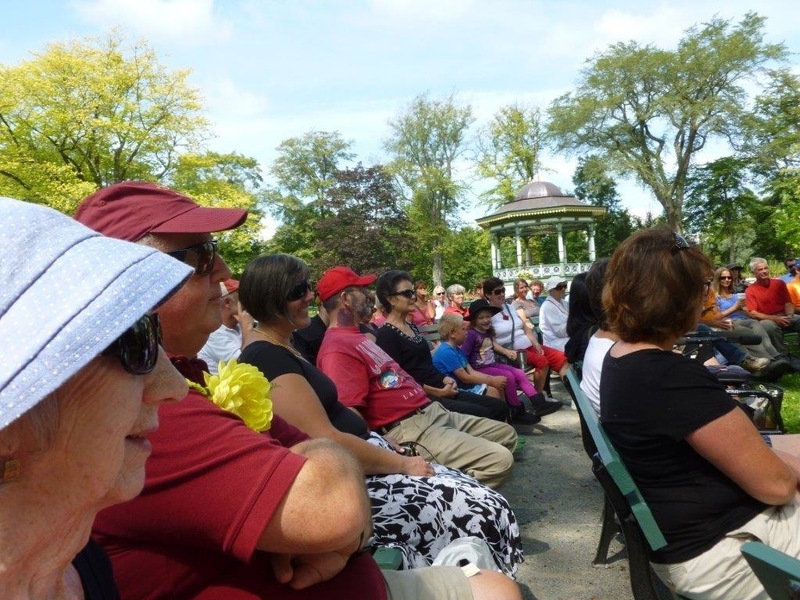 An attentive audience gathered on Wednesday to watch and listen to Neville MacKay perform his magic with Dahlia arrangements. 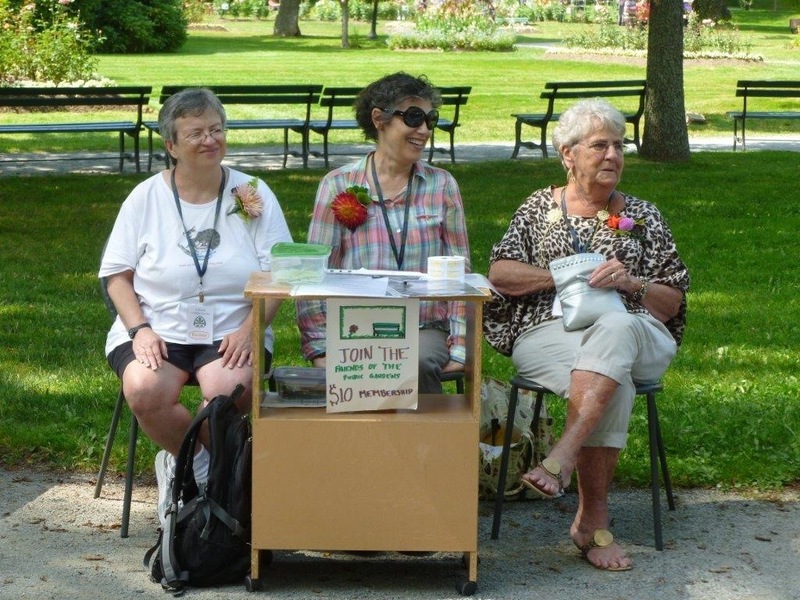 The finished arrangements were raffled off by The Friends of the Public Gardens volunteers, to raise money for restoring the Young Urns. $180 was collected for the cause and the lucky winners got one of Neville’s masterpieces for a pittance. Dahlias grown from seed often come out different from the plants that produced them. 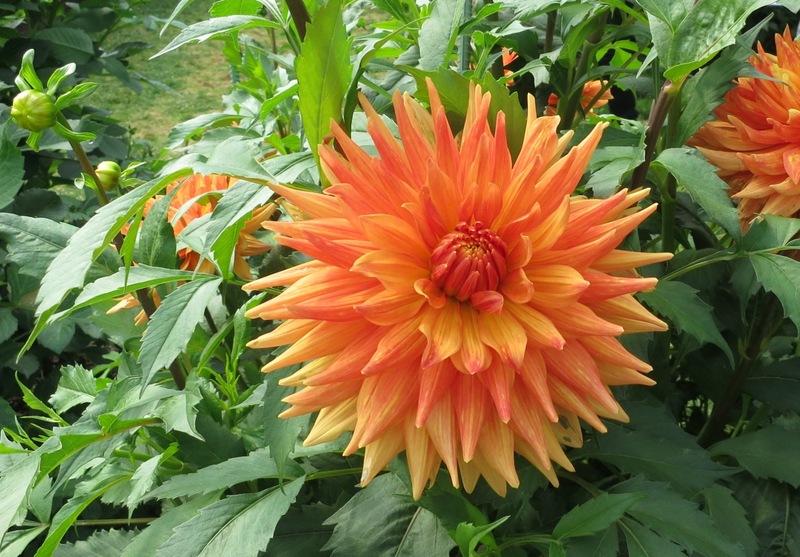 That is one of the reasons why there is such a huge variety of Dahlia’s. 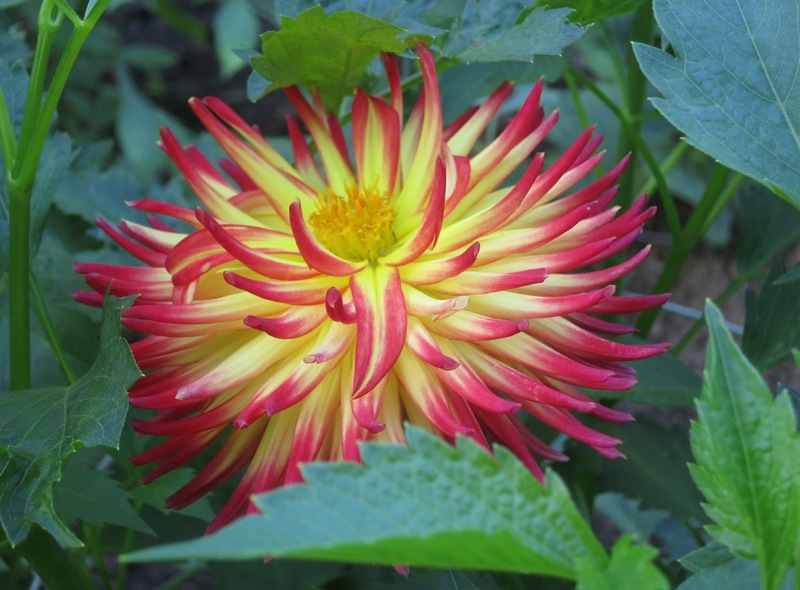 To guarantee your varietal Dahlias should be started from dormant tubers of that varietal. The Dahlia season has just started in earnest at the Gardens. Take the time to view the plethora of varieties available. Some are as big as a dinner plate! If you haven’t yet come for a tour of the Gardens, they are offered free two days a week, Wednesday and Sunday. For times and schedules click here. All copy and images copyright @. If you wish to use any part or whole of an image, in any manner, please contact us. This entry was posted in Halifax Public Gardens, photo tour, Special Event and tagged dahlia, Halifax public gardens by friendsblog5665. Bookmark the permalink.